My mother suffered with it. My grandmother and aunt suffered with it as well. I didn’t escape its torment either. And that’s just one side of the family. It’s a cruel invisible disease that hurts not just individuals but families and generations. Yet I am so grateful that God does give beauty for ashes, and the oil of gladness for mourning. And while I would never have voluntarily chosen for this to have been part of my ministry, I am honored to be able to use part of such a dark time in my life to bring about the light in others. What I wanted more than anything during those dark days was for someone to come along side me, hold my hand, look into my eyes, and say “me too!” What a difference that makes. That is perhaps why my heart grieved the other day when I was so desperately misunderstood. I posted on social media, as I regularly do. This particular post was about the choices we make to let our experiences define us; this time, the experience of depression. 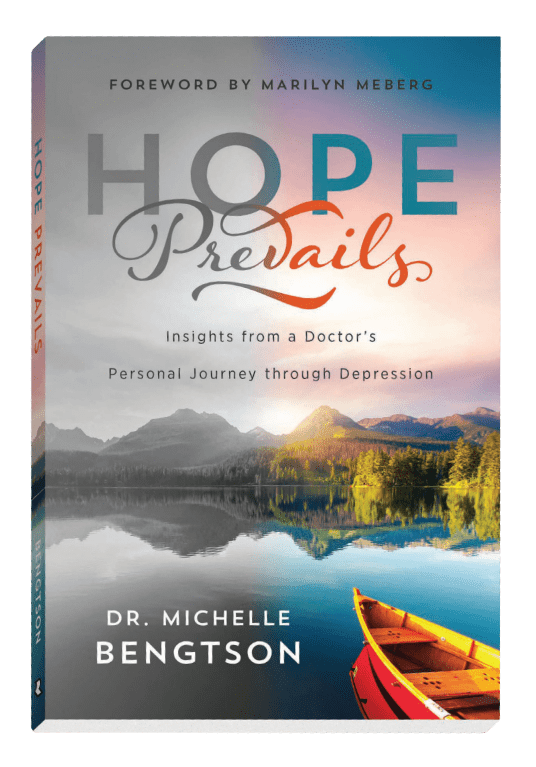 I reflected on what I had learned during my journey from depression to joy, as well as my over 20 years as a mental health provider watching my patients as they journeyed from the pit of despair to their place of victory. 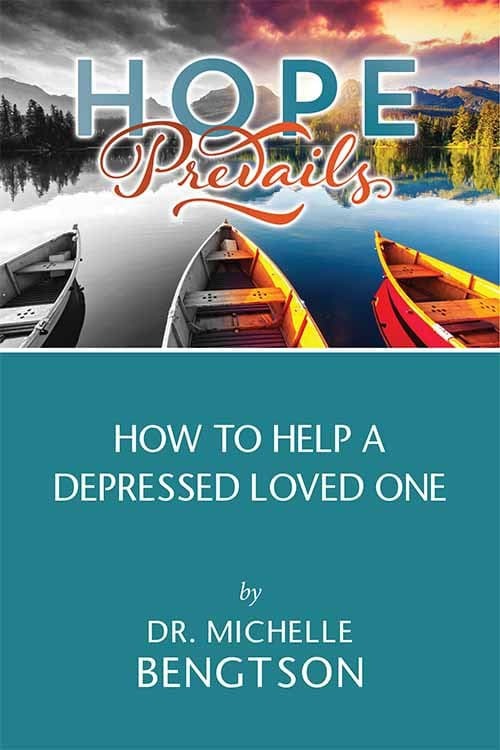 In essence, I said: When someone is depressed, they have a choice to make–to either let depression define them or to desire joy bad enough to seek after it with obedience and sacrifice. Jesus offered us the same joy he had; the fullest possible joy. What I’ve learned is that thanksgiving and gratitude is the doorway to joy. As Proverbs tells us, we are what we think in our heart. 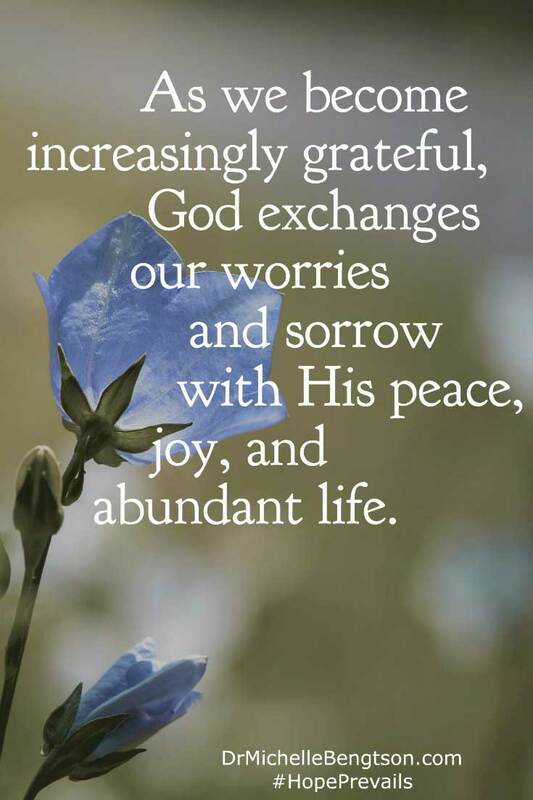 As we become increasingly grateful, God exchanges our worries and sorrow with His peace, joy, and abundant life. Our circumstances may not change, but our mindset does. In #gratitude, God exchanges our worries and sorrow with His #peace, #joy, and abundant life. I was attacked by a reader who found me insensitive and first thought I should have differentiated between clinical depression and subclinical depression, but then went on for several paragraphs to berate me for saying that depression was due to a lack of faith. My heart sunk. Nothing could have been further from the truth. I no more believe that depression is caused by a lack of faith than I do a tropical storm. But I DO believe whether we are dealing with the blues, clinical depression, a concussion, or dementia, we must choose to seek after Him and His answers with our whole heart. He says to cast ALL our cares on Him – not just when things are so bad we can’t handle them on our own. God doesn’t inflict pain on His children to hurt us. But He can use our trials to build our faith, draw us closer to Him, and give us a testimony of His faithfulness for others to see. In my darkest times, desperation drew me closest to Him. Desperation made me willing. I see this same dynamic in my patients and in others as well. It makes me think of the woman with the issue of blood in Mark 5:25 who was so desperate. She pushed through the crowd just to be able to touch the hem of Jesus’ robe. Scripture says we need faith only the size of a mustard seed (Matthew 17:20), and what’s more, Romans 12:3 tells us that God has given each of us a measure of faith. It’s His gift to us. Yet we can choose what to do with it. There will always be things competing for our attention and our beliefs. We must choose whom we will serve, what we will pay attention to, and what we will believe. When I was deep in the valley of depression, I was quick to believe the lies of the enemy, who Scripture refers to as the accuser of the brethren. He delighted in repeatedly telling me I wasn’t as good as others, I was unworthy of a life of joy, I didn’t have enough faith, and I was destined to always feel that way. As long as I listened to the lies of the enemy, I let depression define me. Depression didn’t determine my worth-HE did. Depression didn’t dictate my destiny-Christ’s death on the cross did. Nothing, not even depression, could separate me from His love. Once I began to recognize the enemy’s lies operating in my thoughts, my circumstances may not have changed but I could exercise greater gratitude for the truth: Depression didn’t define me, God did. God declared me redeemed, beloved, esteemed, renewed, adored, and healed. Knowing that and believing that brought inner joy despite the sorrow of my circumstances. I have seen God heal people of conditions instantaneously. Other times it’s a process. Sometimes he heals through prayer and laying on of hands or anointing of oil. Other times it’s through medicine, counseling, or the daily renewing and transforming of our minds. Yet God always desires for us to seek Him in all our ways and let Him direct our paths. In my darkest days I clung to the promise in James 4: 8 “Draw near to God, and he will draw near to you.” That’s how we grow closer to Him, and He gets all the glory. So the other day my heart grieved that anyone would think that I would declare that depression or any other condition would be caused by a lack of faith. The truth is, I think such situations often drive us to a strengthening of our faith and a richer testimony of His faithfulness. And in that, there is beauty for ashes. 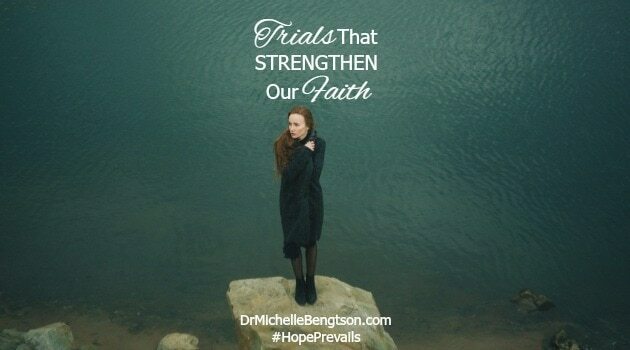 Trials often drive us to a strengthening of our #faith and a richer testimony of His faithfulness. Have you ever gone through such trials that made you desperate? Trials that strengthened your faith? Dr. Michelle, I truly appreciate your words. I, too, have suffered from depression and anxiety. I find comfort in knowing that I have doctors who have helped me, but, my main comfort comes from giving my anxieties to God. I find a peace by knowing He is in control. I believe God gives my doctors the tools to help me and I am thankful. Thank you for your message. Where would we be without knowledgable doctors, therapists, friends, family, but most especially, our GREAT PHYSICIAN and COMFORTER? On my darkest days, I so desperately longed to feel better, but I too took comfort in knowing ultimately God is in control, and I was in the center of His hands. Because of Him, #HopePrevails! Wouldn’t it be nice if we could learn during sunny days and while walking through fair meadows, Michelle!! But, it seems like it takes the darkness and despair to get us on our faces. I know it does in my life. I love this post. However, I have one complaint – there were just too many great things to tweet!! I couldn’t tweet them all! You had me concerned for a second, and I started to say a prayer of repentance for people pleasing, until I continued reading what your complaint was 😉 I thank you my dear sister in Christ for your faithful encouragement. You are a blessing! Because of Him, #HopePrevails! Great post, Doc, and leave the trolls to their bellyaching! My situation’s becoming desperate; I, however, am not. God often seems distant, but that’s because He has left me to get on with the job. Pain – and dread of further pain – are merely parts of life that I am expected to accept without complaint. Duty is everything. My feelings in this matter are nothing. He made my fingers for battle, and my hands for war (Ps. 144). To carp and quail would be unworthy of His workmanship, and His expectations. This is going to kill me; I have no doubt. But it’s HOW we die that matters. I will not metaphorically save the last bullet for myself, or, worse, surrender. When the bolt locks open on the last empty magazine, I intend to fix bayonet – and it will be the moment for the One Last Banzai Charge. A sharp stick, so to speak, in the eye of Paul’s Last Enemy. I’ve missed you Andrew and have wondered how you are! While your situation may becoming desperate I’m so glad you still hold on to the fact that YOU ARE NOT. When we FEEL desperate, God often seems distant, but our feelings are not TRUTH. His truth promises us that He never leaves us or forsakes us, and that He will be with us to the very end of the age. Praying that No weapon formed against you shall prosper my friend. Because of Him, #HopePrevails! Michelle….I am sorry you suffered this attack…obviously from someone who didn’t KNOW you !! It’s so very HARD when that happens. 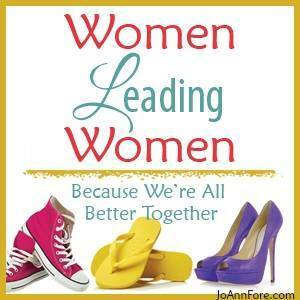 In fact you are a Joshua 1.9 woman, sharing truth about your life with others that they may learn from what you learned going through it. It’s hard to let it run like water off a duck’s back when we are deeply sensitive. God made us that way so that we could readily identify with the pain others go through…but is can get misunderstood, as I myself experienced recently. May God Bless you and seal you under the blood of Jesus, that NOTHING SHALL BY ANY MEANS HARM YOU. Michelle – I understand. Me Too. I have considered depression the thorn in my flesh. I don’t anymore. Depression is the very thing that has taught me how small I am and how big God is. There is nothing that can separate me from His perfect love. And no depression doesn’t define me. I have grown in my faith because of depression. Your post is a helpful reminder for me tonight. Thank you. 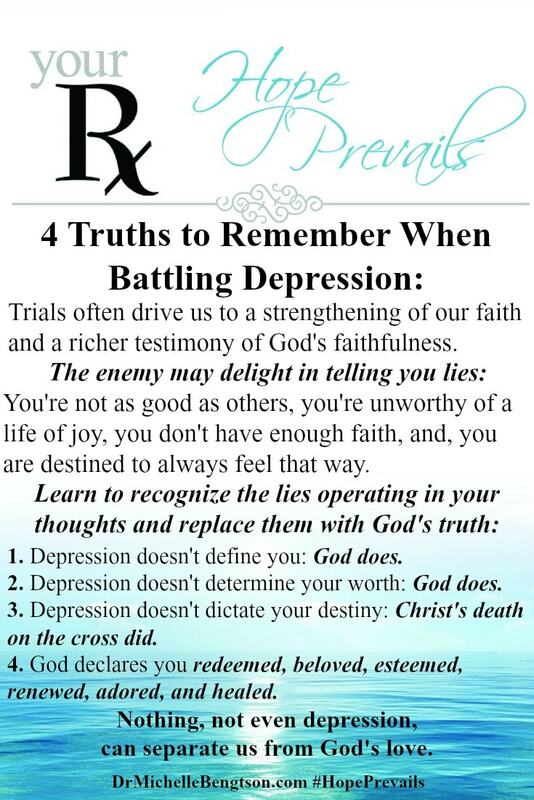 What a beautiful statement: “Depression is the very thing that has taught me how small I am and how big God is.” That right there would be enough to make me consider the pain and misery and despair worth it. No, depression doesn’t define us or separate us from God’s love. 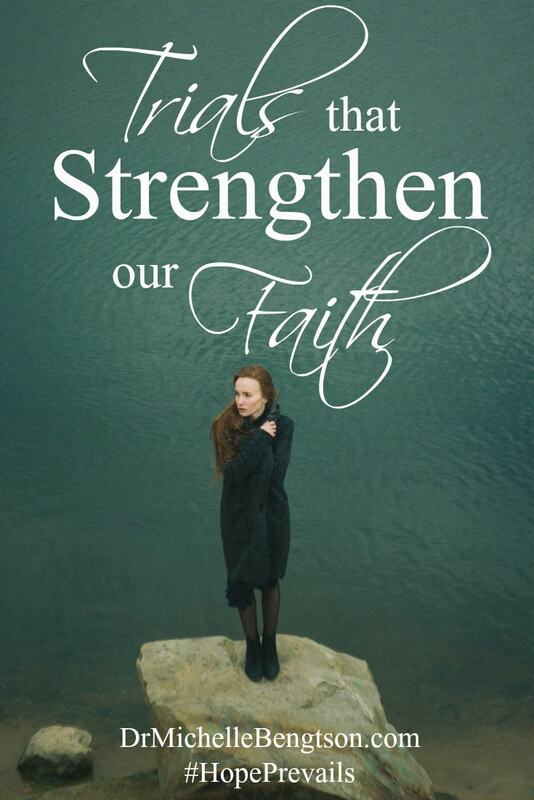 And He will use it to strengthen us and offer help and hope to others. Because of Him, #HopePrevails! Michelle – your heart is so beautiful. I love it. I am sorry you were misunderstood, but we live in a world that does not understand. The Holy Spirit has given you something in the Secret Place that is a treasure. I too came to the Secret Place in need, but I have never left hurting. He always provides. The one who misunderstood may have started this thing, but the Lord finished it AND finished it good. You’re a blessing. Your words are like a soothing balm. 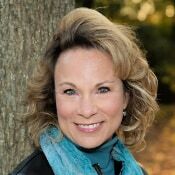 Thank you for taking the time to visit the blog today and to offer words of ministry and healing. It’s never my desire to offend or hurt, and to be misunderstood when my intent was to encourage and uplift, grieved my heart. But I hope that those who know my heart will know that I only long to show others the real source of help and hope. Because of Him, #HopePrevails! I’m blessed to have read this post. Thank you for the great work you are doing to listen, touch, diagnose, support and love as Jesus loves. I believe one of the great tragedies of our culture today is that any of us feel we can just say whatever we want (especially on social media) without consequence. Take heart, for He (and He alone and through us) has overcome the world. Blessings, Michelle. Thank you for your sweet words of encouragement. Even the encourager needs a little encouraging now and then. It’s my joy and my honor to be able to walk along side those who are hurting and in need of someone to offer a hand of Hope. Scripture tells us to offer the comfort that we have been given. It’s my joy to do so. Because of Him, #HopePrevails. 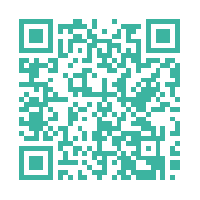 I actually blogged about depression this week too. Thank you for your insight. It’s definitely an issue that is not uncommon to man. Bless you for helping encourage others towards a more positive approach to coping. It’s an issue that needs to be talked about more. Depression is an epidemic and it’s the stigma and shame that keeps it from being discussed more openly. But I know that there is HELP and there is HOPE. And as long as He gives me a voice, I will continue to offer that encouragement and I encourage you to do the same. Because of Him, #HopePrevails! Thanks for speaking to this issue. Depression is a hard path to walk. I’ve walked it multiple times. God is good though, because He walks the path WITH us. Lisa, I’m sorry you’ve walked the path of depression. I don’t wish it on anyone. But you’re right…God walks that path WITH us! Because of Him, #HopePrevails!! Ugh. I hate it when people take what we say out of context. I’m sorry you had to go through that. I absolutely know that during my darkest times, God is closest to me–gently reminding me that he loves me and has hope for me and with me. Anita, isn’t that amazing that you can go through something so painful yet still have the assurance that He loves you, is with you, and offers you hope? We serve an amazing God. Because of Him, #HopePrevails! What an amazing testimony Jenny, to be able to say that “maybe that desperation from a couple years ago was worth it”!!! I love how you’ve gotten to this side of it and can now say that you don’t just need God, but you desire him, want him, and thirst for him. Oh, my friend, what a beautiful thing. Maybe that’s part of the reason that we are to count it all joy when we encounter trials? Because as you say, the desperation is not just the end but the beginning of something even better. And you are so very right “depression does not have to consume us.” Preach it! Because of Him, #HopePrevails!!! I remember dealing with depression years ago (family trait, as well) and being put on some medicine that just didn’t feel right. 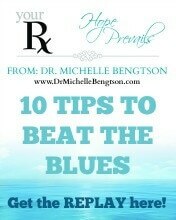 I prayed to the Lord to heal me and rid me of the problems so that I didn’t have to take the pills…and He did!! Praise God! Thank you for sharing with us. I hate that you went through depression. I wouldn’t wish it on anyone. But I grew through my experience, and so many of the other trials I have gone through, so I pray you did too. 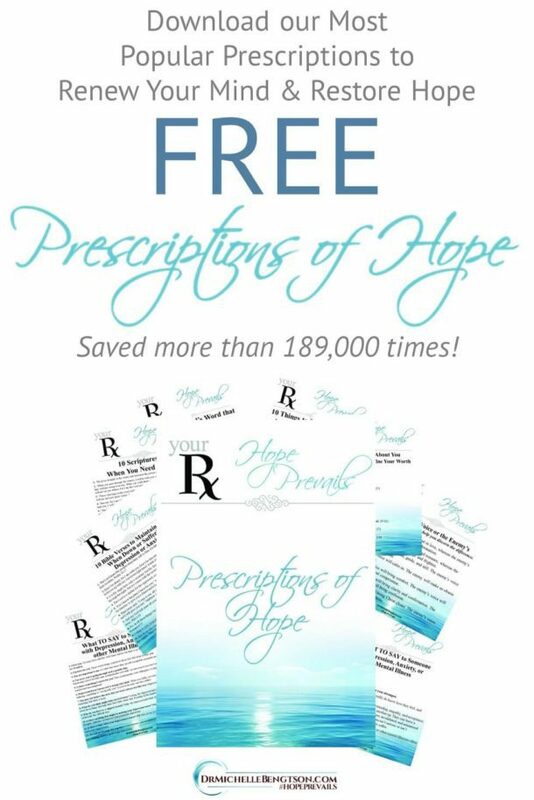 Medication is helpful for some, and for others, the Lord heals in other ways. But the one thing I know for sure, for everyone: Because of Him, #HopePrevails! I’m sure those you talk to feel an immediate connection since you’ve walked in their shoes. Thank you for sharing. Carrie, it’s so often shame that keeps us from sharing our stories, and in doing so, it keeps us from realizing that there are others who could answer “Me too.” If in sharing my story it will help others know that they aren’t alone and point them back to the Hope that Prevails, that brings beauty to ashes, and encourages me to continue doing what God has called me to do. Because of Him, #HopePrevails! Diana, I’m so blessed you stopped by. It’s in the vulnerability of sharing our testimonies with others that we realize we aren’t alone and that God is no respecter of persons, so what he does for one, he will do for others. That increases our faith and our hope. Because of Him, #HopePrevails! Thank you so much for sharing this Michelle. I struggle with depression but I can say one thing — my faith is what keeps me alive. I am so thankful for the Lord and the freedom He gives me, if it weren’t for His grace, I wonder if I would be here. I’m sorry that reader took offence… I can say though, that lack of faith certainly increases depression – at least for me it does. I’m sorry you’ve struggled with depression as well. I wouldn’t wish it on anyone. I truly don’t know how people make it who don’t have faith in the Lord. If I didn’t have Him, I don’t think I could have made it through the darkest times. He is the only thing that gave me hope. Because of Him, #HopePrevails!